Today THQ announced that UFC Undisputed 2010 will be available May 25th for PlayStation 3, Xbox 360, and PSP. I felt that UFC Undisputed 2009 freshened up the stale wrestling game genre, so I’m glad that THQ is getting a chance to expand on the success of the first game. The UFC Undisputed 2010 teaser site has two videos featuring real UFC fighters and a little gameplay footage. The theme of these videos is “So you wanna be a fighter.” I think I might be getting old because I have no interest in being a fighter. I’d much rather control a fighter in a video game since video game fighters don’t have to worry about the bone-density of their fragile looking collarbones. 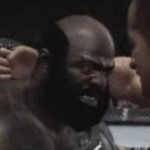 Oh yeah, it looks like famed YouTube brawler turned UFC fighter Kimbo Slice will make an appearance in UFC Undisputed 2010. I’m not entirely sure that was him in the video, but my beard radar or “BearDar” is usually pretty sharp.